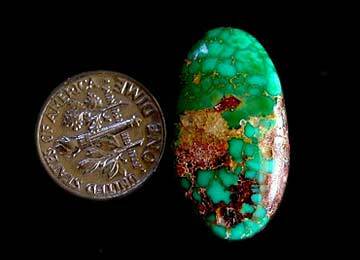 Discovered in the early 1970’s by Joe Barredo, the Darling Darlene mine produced some very fine gem turquoise. It ranges in color from shades of green and light to dark blues. A small mine worked by Barredo and his son-in-law all throughout the 70’s. The mine had been named after Darlene, one of Barredo’s daughters who had passed away as a young woman. The cabochons offered here are from the collection of Joe Barredo's son-in-law and purchased from him within the last year. Their beautiful natural translucence can be seen in the photos below.